Lomandra : Plant Profile and Landscaping Uses. Lomandra is a drought tolerant evergreen clump forming grass. Lomandra are popular for their foliage as well as the highly scented flowers which form during spring – summer. Many species make excellent border plants. Lomandra ‘aussie blue grass’, Lomandra longilofia, lomandra tanika, lomandra confertifolia and lomandra ‘little con’ are popular species and cultivars. Lomandra is increasingly popular with landscapers. Lomandra is a clump forming Australian Native Grass that is not only frost tolerant but also drought tolerant making it an excellent choice for dry areas. Most Lomandras will have small but attractive flowers in spring. 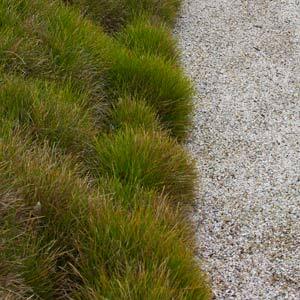 Great for landscaping, borders and as a feature grass. Lomandra ‘Silve Grace’(Lomandra confertifolia spp. rubginosa) is a relatively new cultivar with attractive weeping foliage and yellow flowers during summer. The foliage of this clump forming perennial has a silvery green/grey look and the flower are fragrant. Will reach 40 – 50 cm and prefers full sun to part shade in a well drained position. Drought and frost tolerant once established. L. Longifolia is native to Eastern Australia and is known as ‘Spiny Head Matt Rush’ cultivars include ‘tanika’, ‘katrinus’ and ‘nyalla’. Grass tubestock 50mm, 75mm native tube and 140mm to order. Some of our stock lines; Carex, Cyperus, Isolepis, Juncus, Lomandra, Poa, Themeda and more! Plants propagated on site. Selling natives, popular non natives, roses & fruit trees. Seedlings, pots and advanced. Wholesale, retail & online. Monthly wholesale runs.